Although the Ebola epidemic is well past, many Liberians continue to struggle physically and psychologically, and the need to address the challenges of stigma remains. Médecins Sans Frontières’ focus and mode of care has shifted to respond to this. Psychologist Rebecca Bennett describes some of those changes after her second ‘Ebola’ assignment with us, providing care to survivors in Monrovia, the Liberian capital. “Working in an Ebola context is very different to the other contexts that I have worked in. When I was in Liberia during the outbreak (in the treatment centre known as ELWA 3) there was a large psychosocial team who worked with the patients in the centre, with their family, as a liaison between family members and medical staff for patients, in the discharge, and taking the survivors home to their communities—as well as supporting grieving family members (this included support at viewings of the deceased). Communication is essential in counselling but in ELWA 3, our work was in PPE (Personal Protective Equipment) which covered us from head to toe—unavoidably impacting on our ability to communicate verbally and non-verbally. In the survivor clinic we no longer had PPE, so we were able to make the most of our communication skills to develop therapeutic relationships with the clients. 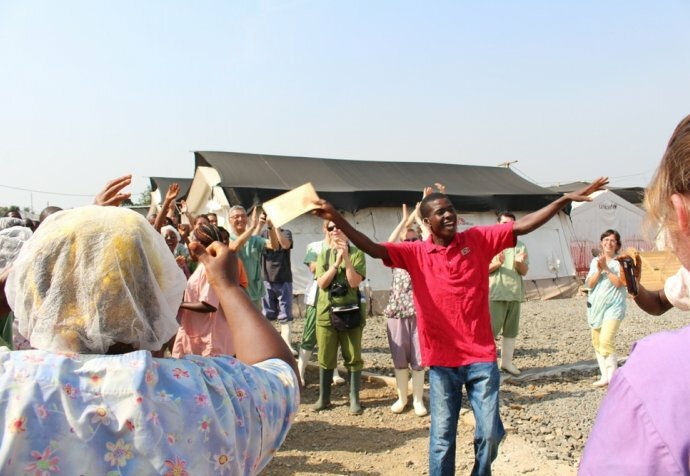 The needs of Ebola survivors are being increasingly documented and the clinic is in a unique position to support and assist survivors with their needs. Our main service is mental health support but there was also a physical health component and the two needed to complement each other. We developed a flow that worked across both. By April 2016 there were more than 500 patients on our register—estimated to be a third of all survivors in Montserrado County. There was a lot of grief amongst our patients. They could attend individual and group counselling through the clinic. I found bringing people together and hearing their stories, and the emotional support they could provide to each other, very powerful. In one of these groups a lady whose husband was a doctor and treated people with Ebola told her story. Her husband had become unwell and then died from the virus. She, his wife, became infected as did many of their family members. She was one of the few who survived, and had essentially lost her support system: her family, and her husband who provided for the family. Since discharge from the treatment centre she has found it hard to get on with her day-to-day activities. She reported going out rarely, feeling sad a lot of the time, and crying regularly. She is now responsible for her children and finds it difficult to meet their needs.